KPC-producing carbapenem-resistant Klebsiella pneumoniae (CRKP) infections are associated with high mortality; however, their virulence determinants are not well defined. We investigated the virulence and plasmid transferability among KPC-containing K. pneumoniae isolates. KPC-2 and -3 were successfully conjugated and retained by a virulent K2 K. pneumoniae recipient isolate. Antimicrobial susceptibility testing showed KPC-2 and -3 donor strains were resistant to more than four classes of antibiotics while the K2 isolate was only initially resistant to ampicillin. After conjugation of KPC-2 and -3, the K2 K. pneumoniae transconjugants became resistant to all beta-lactams. Additionally, the KPC K2 K. pneumoniae transconjugants continued to retain its high serum resistance and murine lethality. Conjugation and retainment of KPC by virulent K2 K. pneumoniae and the ability of the tranconjugants to maintain its high serum resistance and murine lethality after conjugation was demonstrated in this study. These findings are concerning for the potential of KPC-like genes to disseminate among virulent K. pneumoniae isolates. In the Asia Pacific Rim, a pathogen that is well documented is the hypervirulent (hypermucoviscous) variant of Klebsiella pneumoniae. This pathogen causes unique clinical invasive syndromes of community-acquired K. pneumoniae infections including pyogenic liver abscess and a propensity for metastatic spread to distant sites in the absence of a history of hepatobiliary disease [1–3]. In Western countries, the predominant infections due to K. pneumoniae are still the “classic” strains. Infections caused by K. pneumoniae can result in serious and life threatening infections including pneumonia, urinary tract infections, intravascular line infections, soft tissue infections, intraabdominal infections and bacteremia. Because carbapenems are usually the last line of defense for the treatment of resistant Gram-negative pathogens, the development of carbapenemase-producing K. pneumoniae is of great concern. Carbapenem-resistant K. pneumoniae (CRKP) has become a major threat and burden to healthcare systems worldwide as most isolates are resistant to multiple classes and some to all classes of antibiotics making treatment difficult if not near impossible. However, most of these KPC-containing strains especially in the United States do not contain the virulence factors of the strains found in Asia resulting in a less invasive clinical presentation. Likewise, virulent strains of K. pneumoniae causing invasive disease that are usually found in Asia are not known to be multi-drug resistant let alone carbapenem-resistant. However, there have been recent separate reports of endemic KPC K. pneumoniae strains and hypervirulent invasive K. pneumoniae strains found in New Jersey. This study assesses the possibility of an invasive virulent K2 K. pneumoniae strain and its capability of acquiring KPC. The two most commonly found KPC strains (KPC-2 and -3) at the Veterans Affairs New Jersey Healthcare System (VA NJHCS) were used as donors. A virulent K2 serotype KP isolate from a liver abscess patient in New Jersey (University Hospital- Rutgers New Jersey Medical School) was chosen as the recipient . These KPC KP donor isolates were acquired from the clinical microbiology laboratory at the VA NJHCS for this Institutional Review Board (IRB) approved study (MIRB 00937). Antimicrobial susceptibility was determined by the broth microdilution method , according to the Clinical and Laboratory Standards Institute’s (CLSI) guidelines published in 2011. The following antimicrobial agents were used: cefazolin, amoxicillin/clavulanic acid, cefoxitin, cefotaxime, ceftazidime, imipenem, amikacin, gentamicin, ciprofloxacin, and trimethoprim-sulfamethoxazole. Pulsed-field gel electrophoresis (PFGE) was performed as previously described . The resulting genomic DNA profiles, or fingerprints, were interpreted according to established guidelines [7, 8]. All isolates selected were confirmed for KPC production by polymerase chain reaction (PCR). 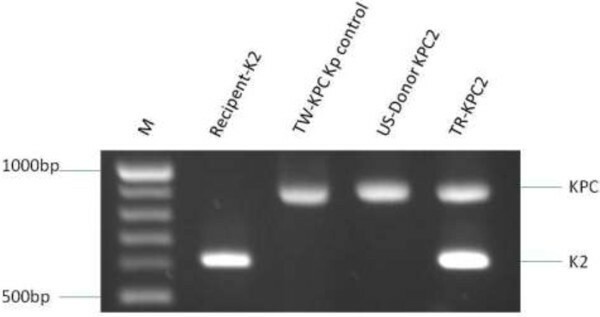 A gene-specific primer set, KPC-F (5′-ATG TCA CTG TAT CGC CGT CT-3′) and KPC-R (5′-TTT TCA GAG CCT TAC TGC CC-3′), was used to determine the presence of the KPC β-lactamase sequence . The amplicons (893 bp) were sequenced using an automated sequencer by the Sanger method (ABI Prism 377 sequencer; Perkin-Elmer) . The generated sequences were compared to the National Center for Biotechnology Information (NCBI) database at http://www.ncbi.nlm.nih.gov/blast/. The transconjugant of the two most commonly found KPC strains (KPC-2 and -3) at the VA NJHCS, containing the KPC plasmid, were used as donors. The virulent K2 serotype Klebsiella pneumoniae (NJ-K2) isolate from a liver abscess patient in New Jersey was chosen as the recipient . Inducing streptomycin resistance as a selection maker in the recipient for conjugation was performed according to previously described methods by Tasi et al. . Briefly, the K2 serotype K. pneumoniae strain was grown in LB broth at 37°C to late-exponential growth phase and then spread on LB agar plates supplemented with 500 μg/ml streptomycin. The cells were incubated at 37°C and spontaneous mutants were obtained from colonies that arose within 3 days. This isolate possesses intrinsic resistance only to ampicillin and streptomycin. Mating procedure with KPC-2 and -3 containing KPC was then performed as previously described [12, 13] except by using specific selection brilliant green agar-containing inositol-nitrate-deoxycholate (BIND) for K. pneumoniae . Serotype K2/KPC transconjugants were selected using the Klebsiella-selective medium BIND supplemented with 2 μg/ml of imipenem and 50 μg/ml of streptomycin. The virulent K2 serotype KPC K. pneumoniae transconjugant was able to grow on the selective BIND medium with imipenem. Positive transconjugants were confirmed by positive PCR with specific primer sequences to serotype K2  and KPC type β-lactamases genes . Transconjugants from the conjugation experiments were subcultured onto MacConkey or Mueller Hinton agar (BBL) for 14 days to check for KPC plasmid stability in KPC strains (KPC-2 and -3) and K. pneumoniae after conjugation (Figure 1). Conjugation experiments of plasmids carrying β la KPC -2 and -3 from parental non-serotype K2 K. pneumoniae to recipient serotype K2 K. pneumoniae . In this conjugation experiment, plasmids carrying blaKPC from KPC-positive K. pneumoniae (KPC-2 and -3) were successfully transferred into the invasive K2 K. pneumoniae recipient isolate (NJ-K2). Specifically, DNA extracted from the invasive K2 K. pneumoniae recipient isolate (NJ-K2) were positive for the blaKPC gene by PCR. Transconjugants, K2 K. pneumoniae::βlaKPC, were obtained by Klebsiella-selective medium BIND supplemented with 2 µg/ml of imipenem. Colonies were then randomly selected from the plate and subjected for serotype K2 PCR. Colonies with PCR positive results on serotype determination were sub-cultured onto the same selective agar plate. Sub-culture of K2 K. pneumoniae:: βlaKPC occurred by inoculating onto MacConkey agar plates for 14 consecutive days. Lane 1, PCR verification of recipient serotype K2 isolate from New Jersey; Lane 2, Control KPC-2 from Taiwan; Lane 3, donor K. pneumoniae with βlaKPC-2, Lane 4, transconjugants K. pneumoniae::βlaKPC-2. PCR experiments to determine the presence of the specific genes for serotype K1, K2, and K5; rmpA; and the aerobactin gene were performed as previously described [15, 17]. MLST were performed according to Turton et al. . Sequences of seven housekeeping genes were obtained for isolates from liver abscess patients and carriers. Sequence information was compared with that available from the MLST website (http://pubmlst.org/kpneumoniae/) developed by Keith Jolley. Alleles and sequence types (STs) were assigned accordingly. Sequences of any alleles that were not in the database were submitted to the curator and a new allele number obtained. A difference in two or more alleles was considered to indicate that the sequence types being compared were unrelated. In vitro and in vivo assays to assess virulence were performed by serum resistance, neutrophil phagocytosis and mice lethality experiments. 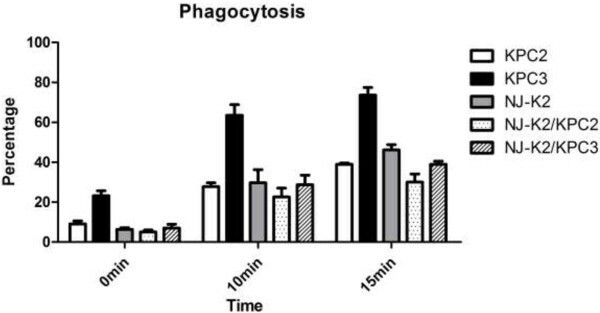 Neutrophil phagocytosis was performed as previously described . The recipient serotype K2 K. pneumoniae (NJ-K2) isolated from a liver abscess was used as a control strain . This strain is hypervirulent with a median lethal dose (LD50) < 102 colony forming unit (CFU) and is highly phagocytic resistance (< 10% of phagocytic rate 15 minutes). For the determination of LD50 in mice, pathogen-free, adult, 6-8-week-old, male BALB/c mice weighing 20–25 g were obtained from the National Laboratory Animal Center. This study was carried out in strict accordance with the recommendations in the Guide for the Care and Use of Laboratory Animals of the National Institutes of Health. All animal care procedures and protocols were approved by the Institutional Animal Care and Use Committee of the National Health Research Institute (NHRI-IACUC-096004-A). Tenfold serial dilutions of KP were made from a starting concentration of 106 CFU, and the adult BALB/c mice had intraperitoneal injections with 0.1 ml of each concentration. Six mice were used as a sample population for each bacterial concentration . Signs and symptoms of infection were observed for 14 days. Survival of the inoculated mice was recorded, and the LD50 was calculated using SigmaPlot version 7.0 from SPSS Inc. In the conjugation experiment, plasmids carrying blaKPC from KPC-positive K. pneumoniae (KPC-2 and -3) were successfully transferred into the invasive K2 K. pneumoniae recipient isolate (NJ-K2) (Figure 1). Subculture of serotype K2 K. pneumoniae::blaKPC onto selective agar plate showed good growth in the selective BIND agar plate. No plasmid loss after 14 days of subculture onto the MacConkey or Mueller Hinton agar plate was observed for K2 K. pneumoniae::blaKPC indicating the stability of the blaKPC plasmid in K. pneumoniae. All strains were verified by PCR to ensure that no contamination occurred during each experiment for donor, recipient of serotype K2 K. pneumoniae, or transconjugants K2 K. pneumoniae::blaKPC. The KPC-positive K. pneumoniae (KPC-2 and -3) isolates showed 100% resistance to piperacillin-tazobactam, cefazolin, cefotaxime, ceftazidime, ceftriaxone, ciprofloxacin, cefoxitin, gentamicin, imipenem and/or meropenem. All β-lactam resistance were maintained in transconjugants while change of susceptibilities from resistance to susceptible were observed in aminoglycosides and quinolones indicating non-plasmid encoding resistance in these classes of antibiotics (Table 1). Detection of K1, K2, and K5 virulence-associated serotypes, and rmpA and aerobactin genes, revealed that KPC donor isolates were non-Kl, -K2, or -K5 serotypes and did not carry rmpA and aerobactin virulence genes. MLST showed that both donor isolates were ST-258 and recipient serotype K2 was ST-65. 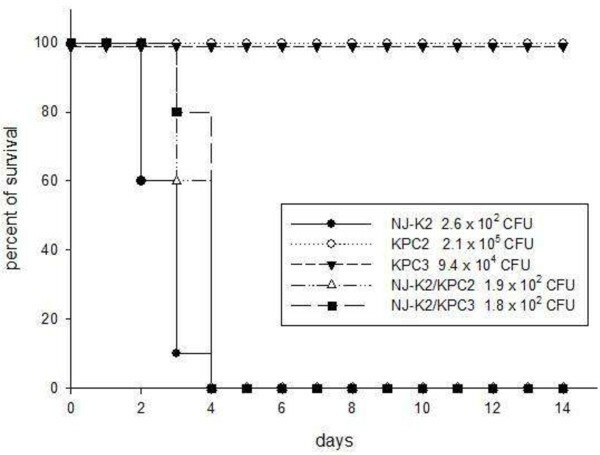 Transconjugants carrying plasmid encoding KPC-2 or 3 showed an increasing resistance to neutrophil phagocytosis in comparing to donor strains which carry KPC-2 or -3 carbapenemase (Figure 2). 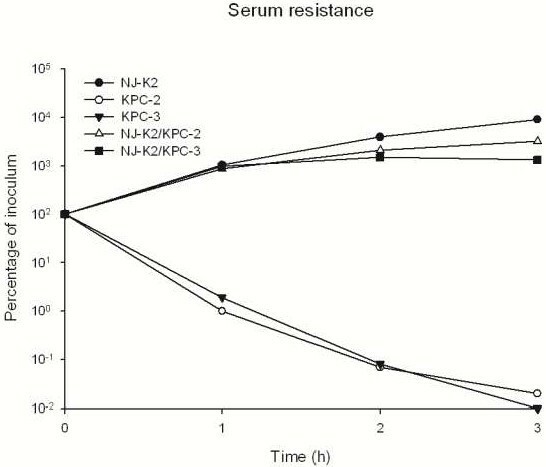 In assessing compliment killing by serum resistance assay, all the transconjugants were resistant to serum killing as recipient serotype K2 K. pneumoniae (Figure 3). Neutrophils phagocytosis assays among Isolates of KPC-2 and -3, serotype K2 recipient and their transconjugants. Serum resistance assays among Isolates of KPC-2 and -3, serotype K2 recipient and their transconjugants. Murine lethality studies by IP injection showed that LD50 were > 106 CFU for the KPC K. pneumoniae isolates prior to conjugation, indicating low virulence. In contrast, LD50 of the transconjugant strain was < 102 CFU after conjugation while retaining KPC and K2 genes [confirmed by PCR (Figure 4)]. In order to confirm the stability of KPC-2 or 3 in transconjugants, PCR detection for serotype K2 and KPC-2 or 3 were used during the infection period. PCR of serotype K2 and KPC-2 or 3 were detected on day 2 and day3 of isolation indicating the KPC-2 or -3 plasmids were stable in the transconjugants during infection. Mice lethality test among Isolates of KPC-2 and -3, serotype K2 recipient and their transconjugants. The survivals after inoculation of K. pneumoniae were counted over 14 days. Data points represent the percentage of mice surviving in each experimental group over time. (n = 6 mice per strain, pooled from two separate experiments). KPC K. pneumoniae was first reported in the United States in 2001. Since its first report, KPC K. pneumoniae has become an increasingly prevalent pathogen and is now endemic in the Northeastern United States. Its spread has been well documented worldwide. According to data from the National Nosocomial Infections Surveillance System Report and the National Healthcare Safety Network, the proportion of Enterobacteriaceae that are carbapenem-resistant has increased from 1.2% in 2001 to 4.2% in 2011. At the VA NJHCS and its affiliated University Hospital (Rutgers New Jersey Medical School), K. pneumoniae is now the second most prevalent Gram-negative pathogen with carbapenem resistance rates of 18% and 12% respectively (2012 VA NJHCS and University Hospital antibiograms). Most of the CRKP isolates found at these two hospitals are multi-drug resistant if not pan resistant to all available antibiotics. Not surprisingly, mortality rates of up to 50% have been reported in CRKP bacteremia cases due to the lack of effective antibiotics. Fortunately, CRKP has yet to be associated with community acquisition. Invasive KP was initially thought of as a regionally distributed disease found in the Asia-Pacific Rim. However, it is now been reported worldwide as an emerging infectious disease . Its virulence determinants and phagocytic inhibition has been well studied . Unlike invasive K. pneumoniae, virulence and plasmid transmissibility of KPC K. pneumoniae have not been well investigated. Our previous study of virulence in KPC K. pneumoniae showed that in 60 unique CRKP, none had the virulent serotypes K1, K2, or K5 nor the virulence factors of rmpA or aerobactin lending to the assumption that high rates of morbidity and mortality due to KPC K. pneumoniae are most likely due to its antibiotic resistance properties and not its virulence. This study showed that the combination of an increased virulent strain of K. pneumoniae acquiring KPC and its associated multidrug associated genes can be created. Conjugation and retainment of KPC by virulent K2 K. pneumoniae and the ability of the tranconjugants to maintain its high serum resistance and lethality after conjugation were possible. The ramifications of having a virulent, multi-drug resistant, KPC-containing K. pneumoniae would be disastrous on healthcare systems . Not surprisingly, with continued indiscriminate use of antibiotics worldwide, KPC-producing K. pneumoniae has been detected in China with the predominate clone being ST11 which is unrelated to the current ST258 clone found commonly in KPC K. pneumoniae found in the United States. With the continued worldwide dissemination of KPC, it is likely a matter of time before the virulent Asian strains of KP will begin to express KPC carbapenem resistance. As demonstrated in our study, further dissemination of the KPC plasmid into virulent types of K. pneumoniae cannot be excluded in the future. Efforts to assess the factors that contribute to attributable mortality in KPC K. pneumoniae infections should be continued, including the study of other virulence determinants, antibiotic resistance, host responses, and their relationship with clinical characteristics and outcomes. KS, DBH, and TC made substantial contributions to conception and design, acquisition of data, and analysis and interpretation of data. KS, DBH, and TC were involved in drafting the manuscript, revising it critically for important intellectual content. All authors read and approved the manuscript.